One of the key pillars to being prepared is having a good water plan. Water is key to life and clean water is key to good health. I have a lot of experience with water filters and have been experimenting with different water filtration methods for years both at my house and in the field. I recently decided to look into a water filter made by a company called Hydroviv and compare it to other filters that are commercially available on the market. 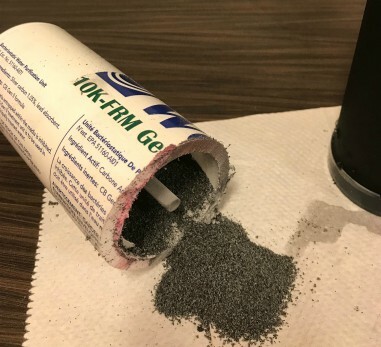 As many of you know, I really am not a big fan of granular activated carbon filters (GAC). I know that this is the worst way to filter water and over time, water will create pathways around the carbon no matter how tight it is packed. Activated coconut carbon filters works with a process called adsorption, this happens as water pollutant molecules attach themselves inside the pore structure of the carbon as they pass through. Typical contaminate particulate sizes that can be removed by carbon filters range from 0.5 to 50 microns. The particulate size that the filter removes will generally be used as part of the filter description. The efficacy, per NSF/ANSI Standards, of a carbon filter is also based upon the flow rate regulation. When the water is allowed to flow through the filter at a slower rate, the contaminants are exposed to the filter media for a longer amount of time. So, the longer it takes for the water to pass by the carbon, the better the level of filtration (Your 10 second Brita filter time is not removing anything, sorry to let you in on this little secret). Activated coconut carbon filters are most effective at removing chlorine, particles such as sediment, volatile organic compounds (VOCs), taste and odor from water. They are not very effective at removing trace minerals & salts, which is why you will sometimes get a high TDS reading on water that has went through a water filter system. TDS meters…you know the $1.25 ones from China that ZeroWater gives you with their water pitcher, are not a good way to determine water quality. TDS measures trace minerals & salts in the water. TDS does not measure other contaminants like fluoride, pharmaceuticals, heavy metals (lead), chemicals (chlorine), pesticides (RoundUp), herbicides, hormones, & more. That is why if you have really read ZeroWater’s marketing material, they never really say that TDS is bad or a health concern. They just say that will get it down to zero. I am much more concerned about chemicals & metals than I am about trace minerals (which I want in my water) which might cause a little bit higher TDS reading. If you really want to test your water quality, you need to send it to a lab and have it checked out. It will cost between $100 to $200, which is cheaper than cancer. Don’t rely on a chinese TDS meter, they are a joke. 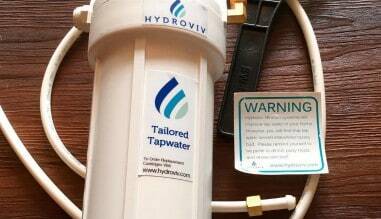 So I was a little disappointed to learn the Hydroviv makes their filters by dumping loose packed carbon into their filter based on some third party tap water testing on a website dating as far back as 2015. I was also a little skeptical about their independent testing…which there is none. I mean, how can you have a filter that claims to remove lead but your filters have not been independently tested based on the design of your filter and how the water flows through & interacts with the carbon media inside the system. Just because you find a filter media (activated coconut carbon or KDF media) that reduces or removes a contaminant, you still need to have an independent lab test your design and filter and prove your theory for the consumer. If I live in a old house (which I do) and we have old pipes both in our house and in our neighborhood that are leaching lead into my water. I want to know how much lead your filter is going to remove, for how long, and is your filter certified by a 3rd party. Unfortunately Hydroviv does none of these. They offer no data on the amount of lead reduction their filters achieve, they have no capacity testing to tell you how long their filters work for, and they have not been independently reviewed or certified to NSF/ANSI standards so buyer beware when it comes to these filters. I will compare Hydroviv vs 2 other commercially available water filters just so can see the difference between a quality home filtration product and what I think are jokes. Also Read: Do Brita Water Filters Work? Woder 10k-DC Water Filter – Woder, a company that sells a lot of water filters on Amazon makes some pretty outrageous claims about their product lasting to 10,000 gallons. I recently purchased one of their products just to see what kind of special sauce was in their filter that could last all the way out to 10,000 gallons. I mean, that is a crazy claim and it had to be some new space age material that no one had ever heard of to do this type of massive filtration all the way to 10,000 gallons!!! 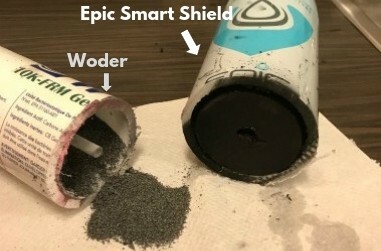 I was extremely disappointed to find out that like the Hydroviv system, Woder was just using loose packed granular activated carbon (GAC) filters like the cheap style filter that Brita uses. I always tell people, if you shake your water filter and you can hear it move around like it has sand inside, you have a cheap water filter. As you can see from this picture (I took the saw out & opened up a Woder filter to see that magic stuff) it is all Bull Sh*t. I also tried to dig into their testing because as a prepper, I want a water filter that removes a ton of contaminants and I need to know when I have to change the filter to protect my family. Woder’s testing…well good luck finding it on their website. It does not exist. Like Hydroviv, a lot talk about being a great filter but not a lot of backing it up with real data. Between Hydroviv and Woder, I guess at least Hydroviv is trying to do the right thing. Woder is just out there making crazy claims with no science or proof behind it. Neither is a good choice in my mind. Epic Smart Shield – Epic Water Filters is a company that I have reviewed several of their products and like other water filtration companies that I like (Berkey, MSR) they use solid carbon block filters. Everything that I have read, all of the testing that I done, all of the data that I have reviewed says that carbon blocks are superior to GAC filters. It is not even close. So when I look at the Epic Smart Shield vs. Hydroviv vs. Woder, it is not even close. Yes, the Epic Smart Shield is a few bucks more but when you dive into the details of the products the Smart Shield is worth every penny. Also, the Epic Smart Shield is an American made carbon block filter that has been tested and certified to 3 different NSF/ANSI drinking water standards by an independent laboratory. Unfortunately, Hydroviv & Woder decided against independent third party testing leaving their customers to worry if their filters are really working properly. As you can see from this picture, I cut open both the Woder and the Epic Smart Shield and put them side by side. Think about trying to get water through that thick carbon block filter vs. the loose packed carbon sand. You can shake the Epic Smart Shield all day along and you will not hear it make any noise. 🙂 It is solid brick of carbon. Here is a quick overview of the three different under the sink water filter products. Made from solid carbon block filter? Tested to Remove Glysophate (RoundUp)? Comes with a dedicated faucet version? Bottomline: Do your research on a company or product before you buy a water filtration product. There is a lot of junk out there, especially all of the Chinese junk on Amazon. Dive into their data or lack of data. Look for companies that show third party testing & certifications. Read their reviews and customer service experience.